With regular demonstrations and step by step, simple easy to follow instruction, learn how to create different effects and produce a variety of pictures. I regularly run pastel classes for landscape, portrait and pet portraits through the year but also run occasional pencil sketching, pen and ink and beginners watercolour classes. 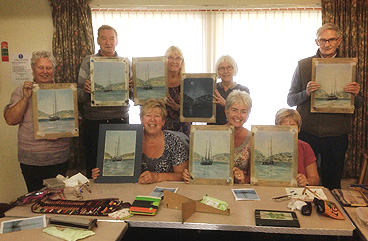 Pastel classes are held on Mondays, Wednesdays and Thursdays in Mold Methodist Church throughout the year covering a variety of subjects. They run for sets of either 4 or 5 weeks during school term times. There is a maximum of 10 people in each class. Classes on Monday 10.30-1pm and Thursday 1.30-4pm cover a variety of pictures from landscapes to still life. I work using a step by step method, showing you how I create the pictures and use the pastels. Classes on a Wednesday 10.30-1pm or 1.30-4pm vary during the year between Portraits and Animal Portraits. During the 5 weeks you will work on building up a portrait. I show you how to achieve the colours and effects which you will then put into practice. All materials are available for you to use in class. This class runs once a month, usually the first Friday from 9.30-12.30pm. Maximum 8 people. There is no set subject or medium. People bring along their own reference material then with my help and guidance decide where to start your drawing, how to achieve the colours, effects and textures. I send out details of the latest classes 3 or 4 times a year. If you would like to be included in this mailing list please contact me with your email address and phone number. Within Bodnant Craft Centre, Bodnant Road, Colwyn Bay, LL28 5RE. The Helfa Gelf Art Trail with the Cilcain Artisans, Cilcain Village Hall, CH7 5NN. Check this page regularly for details of upcoming events or to receive a notification directly to your inbox, subscribe to our newsletter below (you can unsubscribe at any time).